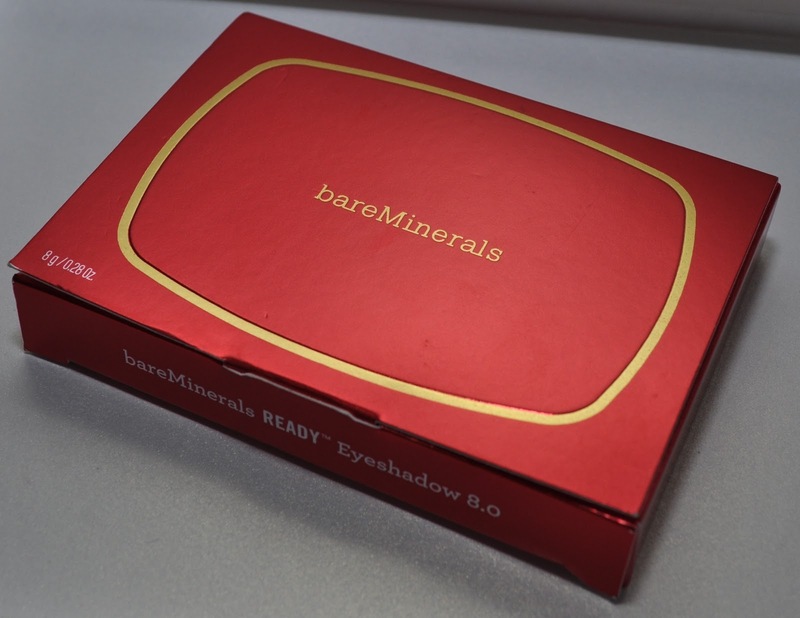 The bareMinerals pressed eyeshadow palettes have been getting a lot of love so I made sure I picked one up when I saw it for sale on strawberrynet.com a few weeks ago. I decided to get the palette in ‘The Playlist’ because the shades were more warm toned and looked like they’d look better on me than the other palettes. 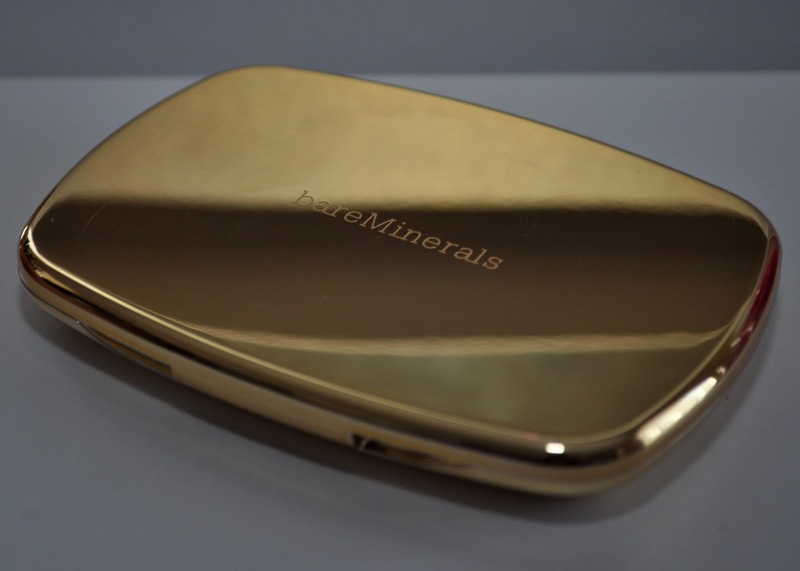 Packaging wise, I cannot fault this product because everything from the outer packaging to the gold compact inside are very well thought out and aesthetically pleasing. I only wish that bareMinerals had thought to include some sort of pouch with the compact because this thing gets scratched and dirty really fast because of its metallic finish. 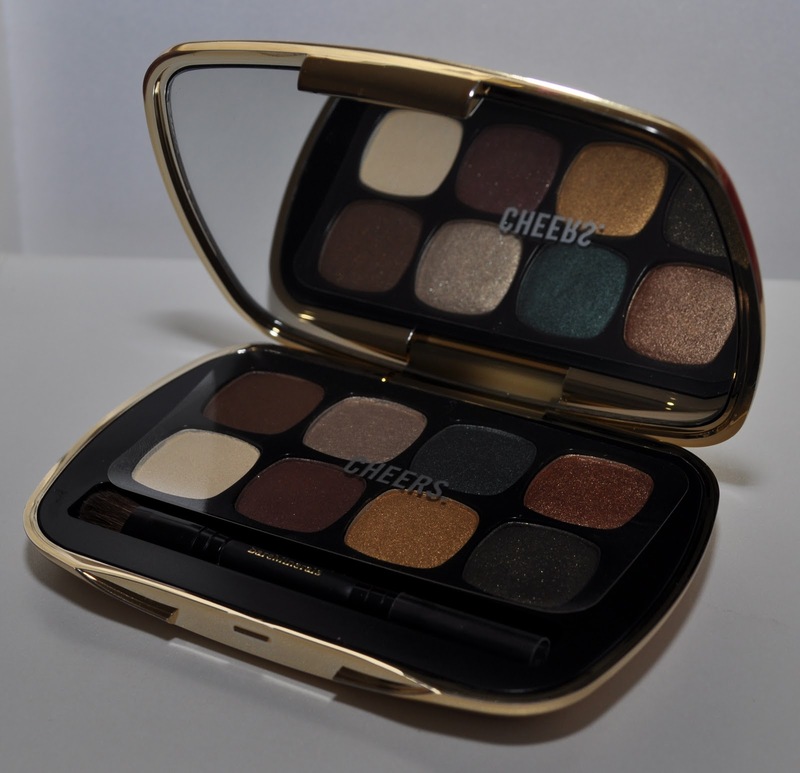 The palette comes with a really good sized mirror and a travel sized double ended brush which you could definitely use to do your makeup on the go. The colours are all named to fit the ‘playlist’ theme and you get 1g of each shade which is a really decent amount of product. For reference, you get 1.3g of product in each MAC eyeshadow pot. 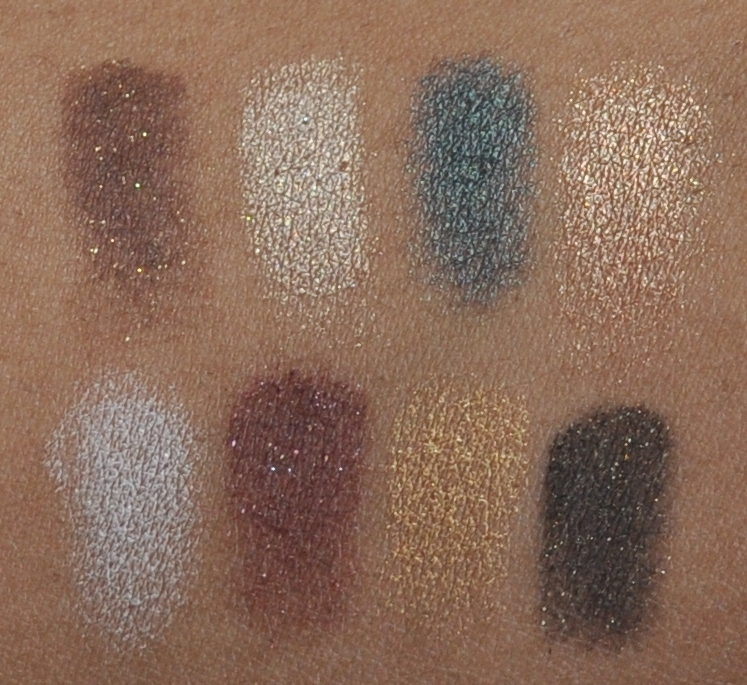 I thought that the shade selection was great except that all of the shadows have some sort of shimmery/metallic/glitter finish to them. I think this palette is missing a good neutral matt shade to use for blending purposes or it would be one of my favourites. 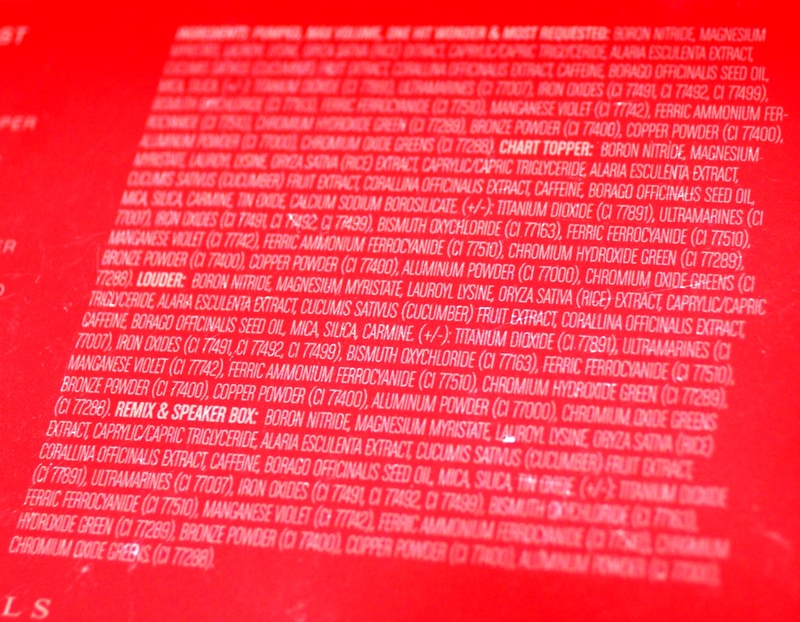 The shades ‘Pumped’, ‘Most Requested’ and ‘Speaker box’ are shimmer filled shades which contain gold glitter in them. 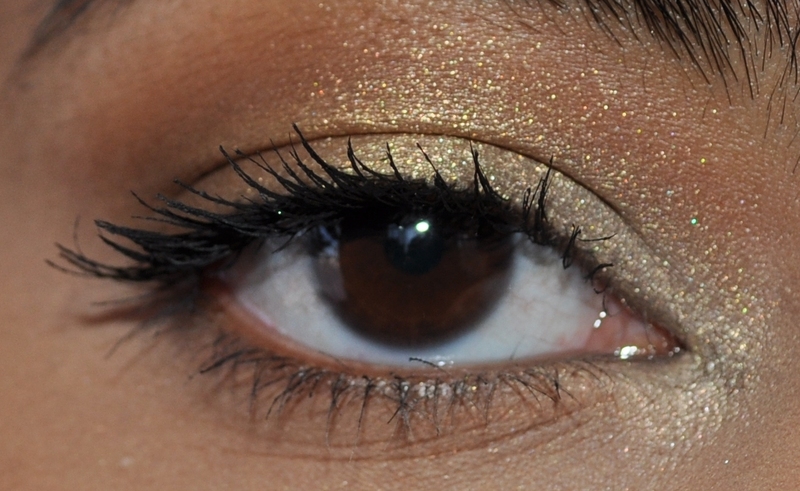 the glitter particles tend to create a lot of fallout so I’d apply them before doing the rest of your makeup. The rest of the shades are very mettalic and don’t have any fallout. The quality on these shadows is fantastic and I can see why they get such good reviews! The shadows are all really soft and easy to work with and I didn’t have any trouble blending them together. A little pet peeve I have is that, because they’re so soft, running a brush through the shadows tends to kick up some product that flies over the other shades. Not a big deal but it may matter to someone out there! … reading the little blurb above (which was included inside the box) I was expecting that these shadows were ‘all natural’ and made for sensitive eyes but, after wearing these for a night, I found that my lids started getting really irritated and felt like they were burning! I looked at the ingredient list (which I probably should have done earlier) and found that the shadows have a lot of different metals in them which I’m allergic to. This is an FYI for other people like me who have metal allergies to try this palette before you buy! 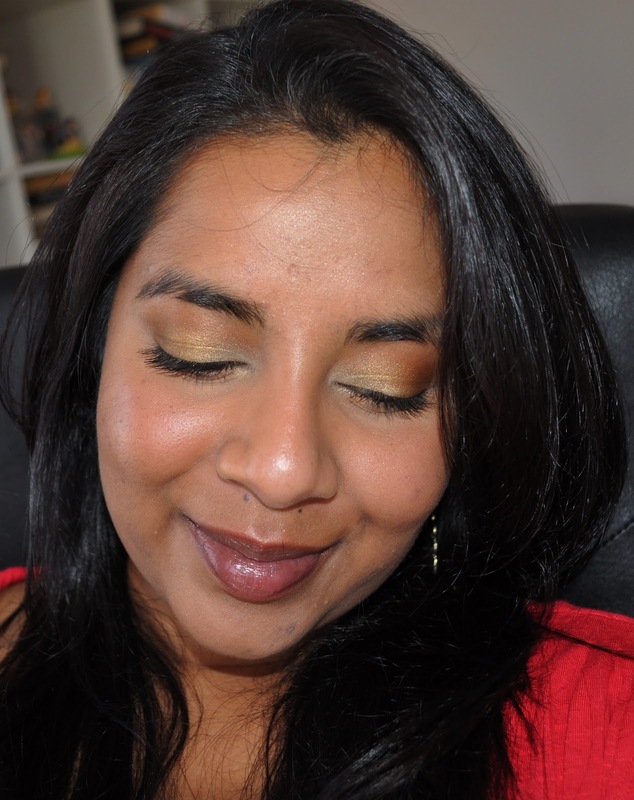 Before the ill fated allergic reaction, I decided to try out the look below to see how the shadows wore. 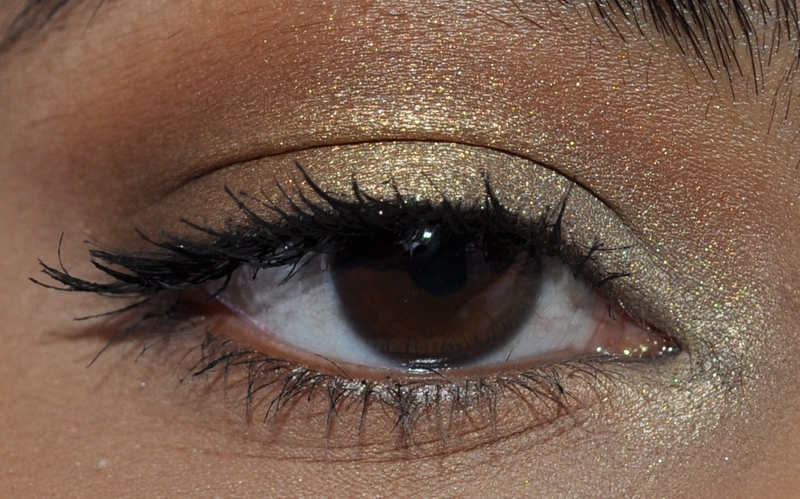 It’s a really easy look using three of the shades in the palette and MAC Saddle eyeshadow in the crease. 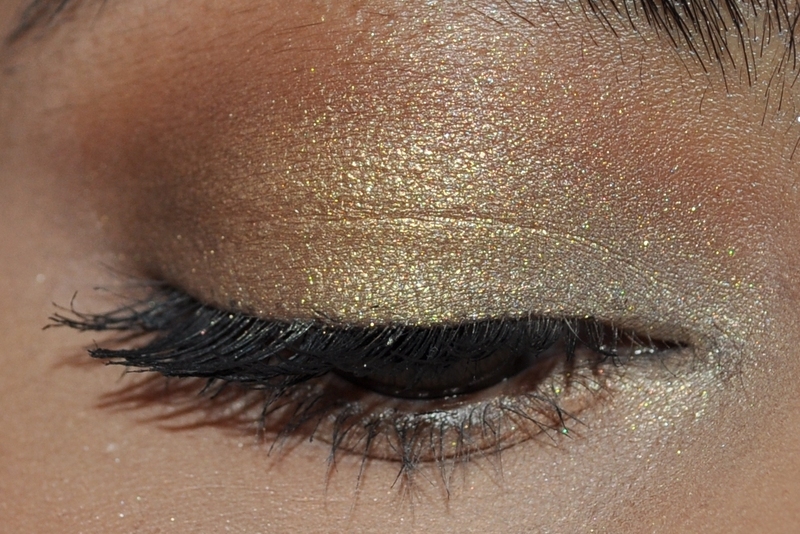 I just applied MUFE Aqua Cream in Gold as a base and then applied the gold shade ‘Remix’ to the lid. I blended ‘Pumped’ on to the outer v and into the crease and then blended out the edges with MAC Saddle eyeshadow. 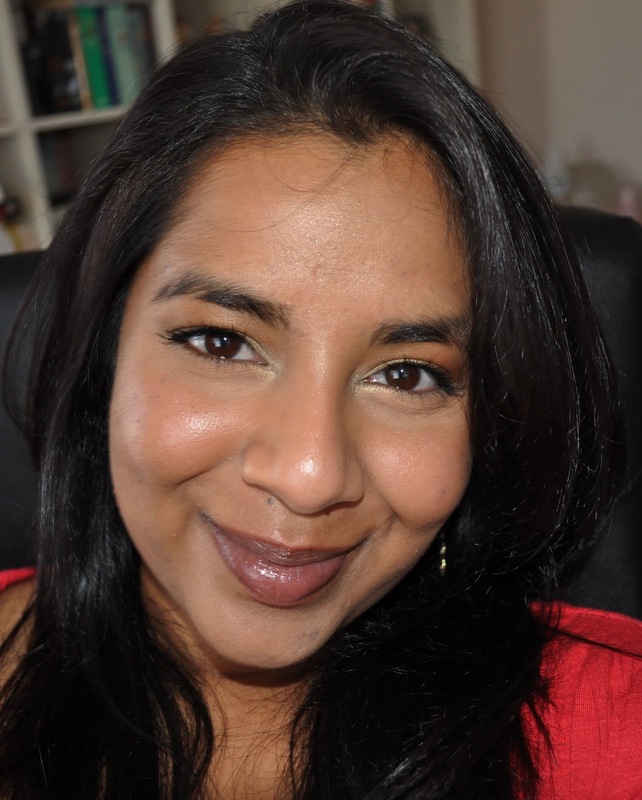 I finished up by blending ‘Chart topper’ around the inner corner and put on some Rimmel Extra Wow Lash mascara. I think the shades all compliment each other and work well to create a radiant natural look or as a complimentary eye for a bright lip look. 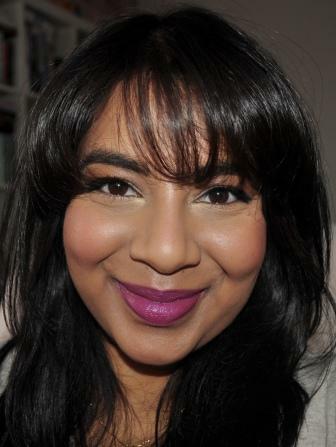 I ended up pairing this EOTD with a red lip gloss by Mirenesse called Geisha and NARS Exhibit A blush but of course I forgot to take pictures after I put the gloss on! I think this palette is great and I would have used it regularly if it wasn’t for my allergies 😦 I picked mine up from strawberrynet.com for about $42 and I think it’s worth the price for the amount of product you get. 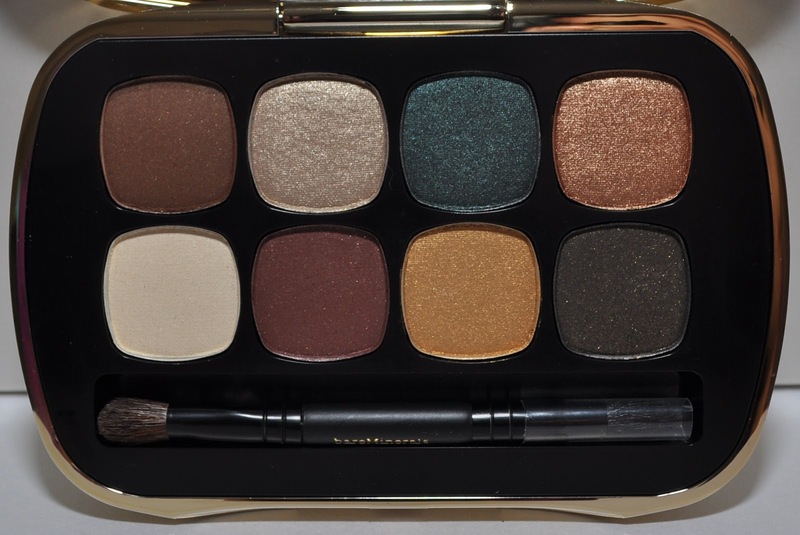 The variety of shades makes it a good alternative for both natural (but shimmery) or intense looks and you’d get a lot of different combinations from the palette. 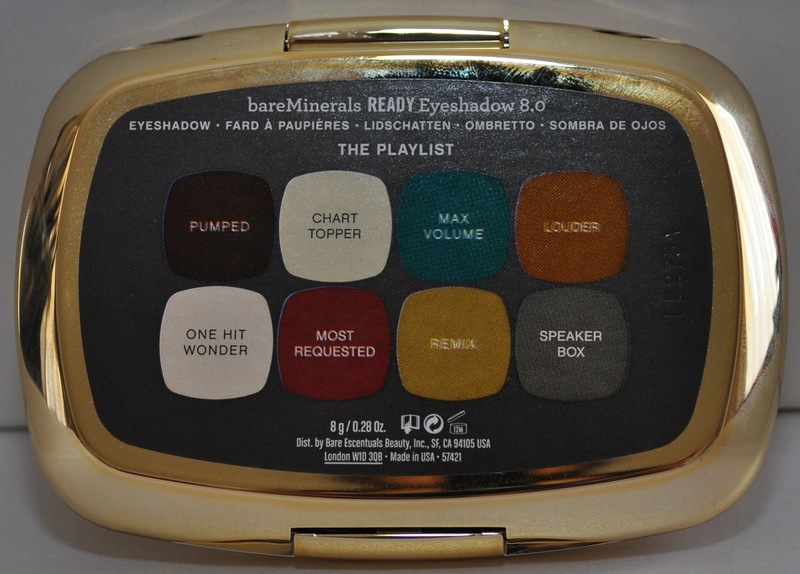 What are you thoughts on ‘The Playlist’ palette? 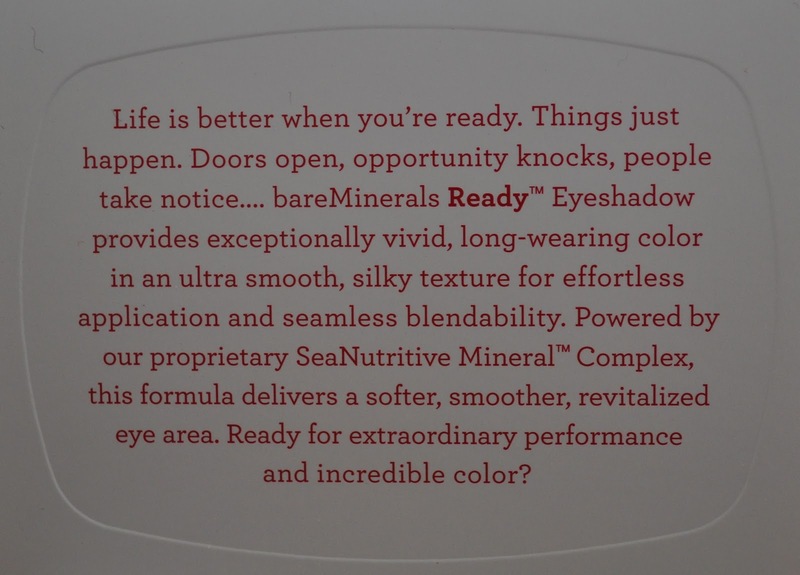 Have you had any reactions to bareMineral’s products?